Quality is one of the core values of our business. We set benchmarks in manufacturing and process quality – for ourselves and for others. We headed the development of the first standard for friction stir welding, DIN EN ISO 25239, which has defined the specifications for our welding process since 2012. We have been ISO 9001 and ISO 15085 certified for many years now, and with our continuous improvement system we strive to permanently improve our processes – with the active participation of our workforce. We inspect our welds in-house in our specially equipped testing room. This keeps every shift up to date and enables us to respond promptly if any nonconformity is detected in a weld. We also have a 3D coordinate measuring machine, which ensures that checking the dimensional accuracy of our components is no problem for us. A completely different aspect of the quality concept: reliability! We have invested heavily in our machines over the years to guarantee fail-safe operation. We now have a back-up solution for every machine in case anything malfunctions. These days, ISO 9001 certification is almost the rule, so we are obviously also compliant in this respect. 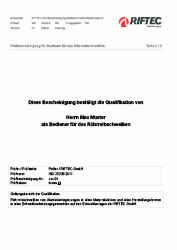 For our customers in the automobile and railway vehicle construction sector, this is a basic precondition for recognition as a supplier. We completed the upgrade to 2015 in good time, and we are proud to display our current ISO 9001:2015 certificate. 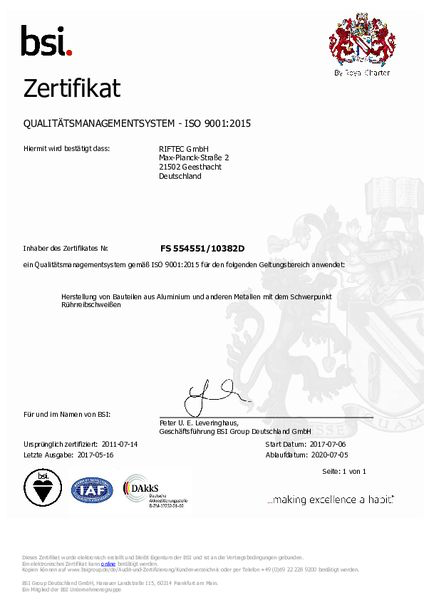 Our ISO 15085-2 certification is somewhat less commonplace. 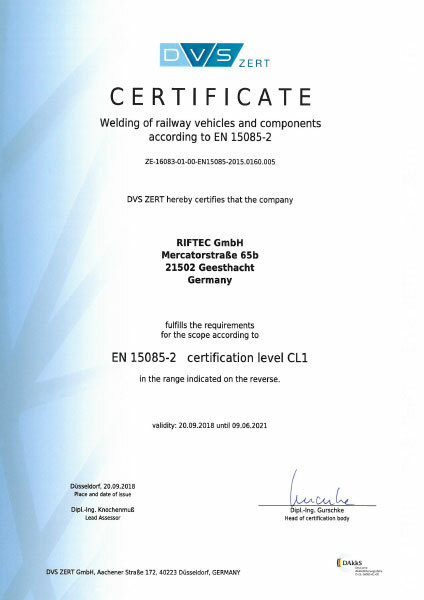 We have now been certified according to class CL 1, which means that we meet the most stringent requirements set for railway vehicles. The DIN EN ISO 25239 standard for friction stir welding was introduced in 2012. That's another plus for our customers, because this standard defines the quality specifications for this still relatively new process and allows comparison with other joining processes. It is another reassurance for our customers. 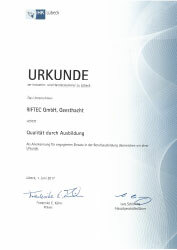 We at RIFTEC GmbH played a key role in the formulation of this standard, and since then we have been actively involved in improving it and always keeping it state-of-the-art. 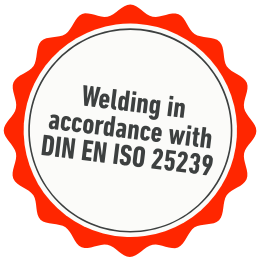 We weld in accordance with DIN EN ISO 25239, which means that we qualify not only our welds, but our operators as well!